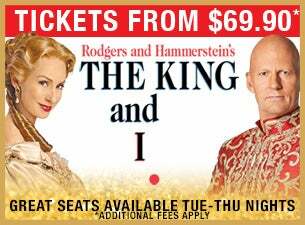 THE KING AND I returns to Australia with the first lady of Australian musical theatre, LISA McCUNE and international opera sensation TEDDY TAHU RHODES as the King of Siam. Don’t miss this legendary production of Rodgers and Hammerstein’s THE KING AND I. A triple crown award winner: The Tony, the Drama Desk and the Outer Critics Circle for Best Musical Revival, this dazzling show is a lavish and triumphant fresh new look at a time-honoured classic. Hailed as ‘THE MOST RAVISHING SHOW YOU MAY EVER SEE ON BROADWAY’ when it opened in 1996, this multi-award winning production of THE KING AND I was created in Australia and conquered Broadway and London before touring the US and the UK. It is a story of love and joy, set to one of the most glorious, unforgettable scores ever written, including Shall We Dance, I Whistle A Happy Tune, Hello Young Lovers, Getting To Know You, I Have Dreamed and Something Wonderful. For decades, THE KING AND I captivated millions with its delightful story of Anna Leonowens, brought to the court of Siam as tutor to the King’s children. This is a dazzling musical celebration, a sumptuous production with stunning scenery and magnificent costumes, definitely an event not to be missed.